Raise your hand if you grew up on Hidden Valley Ranch. We ate this stuff on everything and with anything. Most notably pizza and mashed potatoes. NEVER! Not as kids at least. 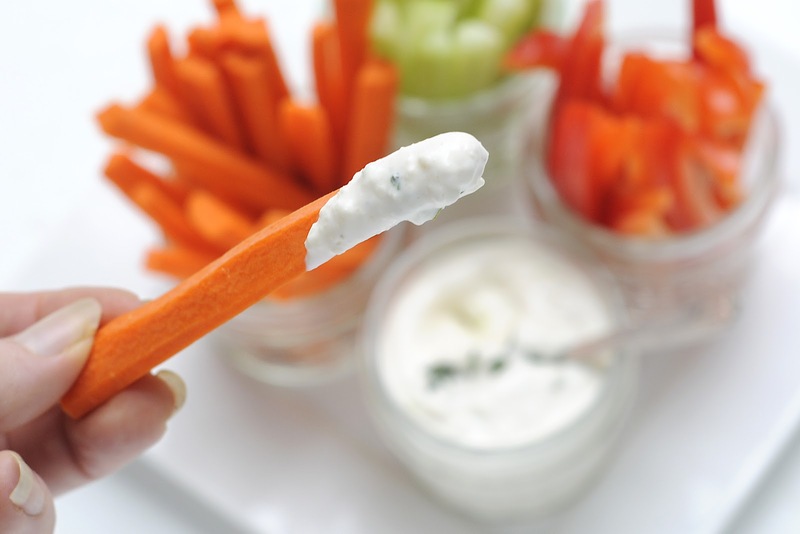 When I got a bit older we slowly used it to dip a carrot or two, this was on a rare occasion, every once in a while and usually when our Mom wasn't around. If she thought my sisters and I were eating a vegetable of our own accord, who knows what type of hysteria that could send her into. I must have ruined myself. I have tried this dressing at different times of my adult life and, honestly, I can't stand it. I am convinced they sold out and changed the recipe. It taste of artificial sugars and blandness. When we eat out, I usually get ranch on the side and then something else. On the rarest of outings, do I find a salad dressing, let alone, a ranch that I love. I do eat a lot of salads, especially being wheat free. Most restaurants have some type of lettuce entree that I can usually eat if nothing else will work. So dressing is important to me. I have honestly thought about taking my own dressing with me when we go out to eat. 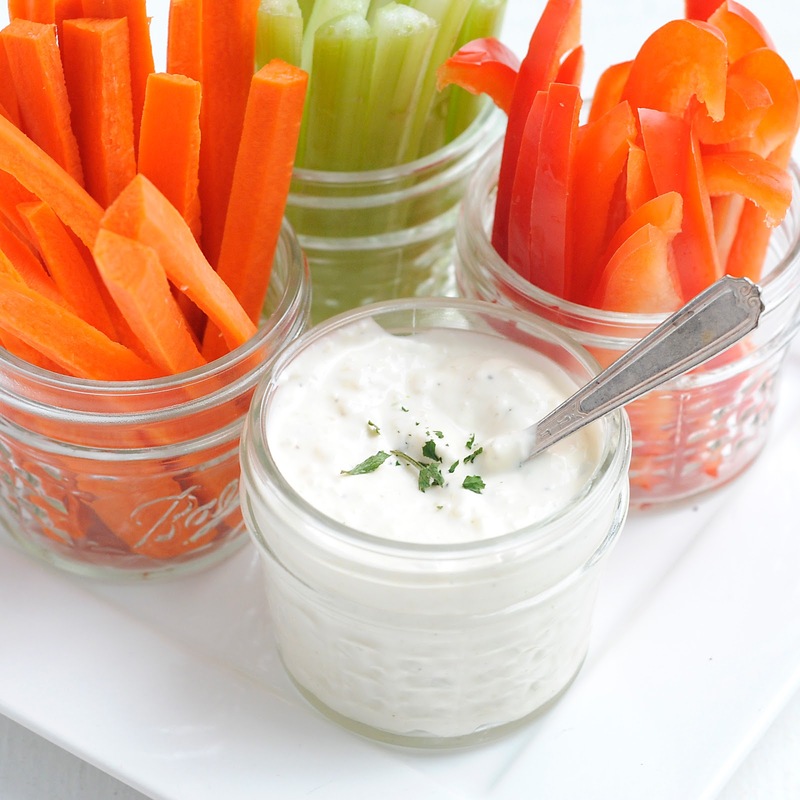 I make Parmesan Ranch Dressing two ways: thick and thin. Thick for us to use as a dip. The obvious, thin for salads. I personally like it thick on my salads too but my family does not. My favorite way to eat this salad dressing is to buy those little heads of lettuce, they usually come 4 to a package at Whole Foods. They are the perfect size for a single portion of salad. I wash the green and purple leaves with ice cold water to keep the crisp green leaves at their best. I give the small head a shake or two and then I ever so gently twist the end off. It feels almost violent at how easily it falls off into the palm of my hand. The lettuce tearing at the resistance of being twisted against its will. I unroll two sheets of paper towels and lay the leaves out to dry. I fold the two sheets together to sop up the pools of water that nestle in the crevices of the leaves ridges. Once dry, I transfer the leaves to a plate. I cut up celery, carrots and bell pepper into long sticks. Grab a small bowl of salad dressing and find a quite place to sit at our table. Usually looking into our back yard at the trees swaying back and forth in the wind. Taking a lettuce leaf and holding in the palm of my hand, I lay a stick of carrot, a stick of celery and one of bell pepper. Roll it up and dip it into the Parmesan Ranch Salad Dressing. What emerges is a thick white blend of sour cream and mayonnaise, sprinkled with garlic and green onion. The obvious presence of parmesan is visible. This is where the flavor resides. I double dip, again and again. My belly is happy, my taste buds are satiated. Such a simple item to have in your arsenal of condiments. I have blended this into mashed potatoes, steamed cauliflower and creamy soups. Tell me what your favorite salad dressing is below in the comments. I am always on the look out for new flavors. I love veggies. Give me a big salad with lots of thick dressing and some bread (sorry, I know you're wheat free) and I'm happy, happy. I always make my own dressing - usually a simple lemon vinaigrette but sometimes I cream it up with a tablespoon of mayo. Rather than use yogurt, I just use low fat mayo and low fat sour cream. My extra creamy dressings are mayo, sour cream, buttermilk, lemon juice and the herb of choice. I like chives, scallions or dill. I am so glad to have found you!!! Your site is gorgeous. So clean and crisp. I love it. Did a search on pinterest and this recipe came up. I have tried countless "hidden valley ranch" recipes and they were all blah or awful. This recipe is so good. Taste just like ranch dressing. Thanks so much for sharing this recipe.